Oil on panel, 24,5 x 20 cm. This small painting is presumably from the late period of Metsu’s life, where solemn depictions of everyday lives of peasants, the bourgeoisie and servants become more prevalent. Located at the centre of the painting are the young woman’s face and left hand, which holds a beautiful red apple. She sits slightly bent over, as if frozen in action, lost in thought with an introspective gaze that gives the painting a quiet, dreamy expression. 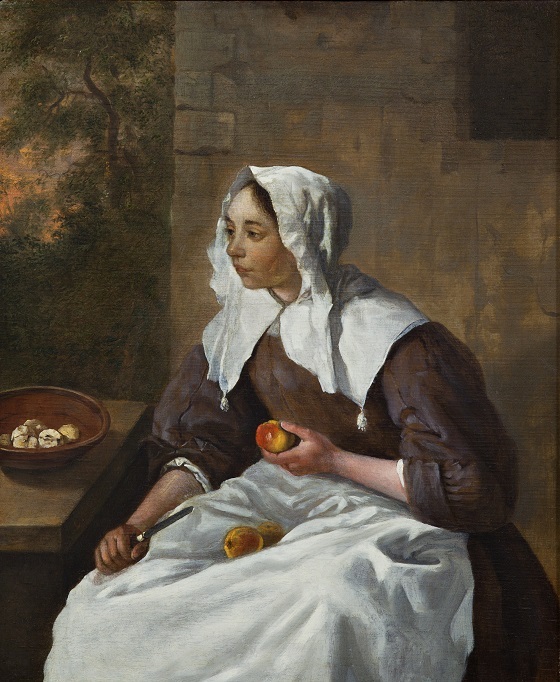 A group of trees in the background, through which the rosy evening light can be glimpsed, gives depth to the composition, and the girl’s white headcloth, collar and apron create large, harmonic fields of light around her face and the hand with the apple. On the edge of the table, the artist has signed the painting “G Metsu”. Gabriel Metsu was a Dutch painter. He is said to have been the student of one of Rembrandt’s apprentices, Gerrit Dou. Metsu specialised at an early age in genre pictures, portraits and history painting in the style of Jan Steen, among others. Later in life, his paintings became more subdued in colour and his subjects reminiscent of the depictions of the stylish domestic life of the Dutch bourgeoisie by the great Flemish Baroque painters Jan Vermeer and Pieter de Hooch. Metsu developed a personal painting style with a characteristically wavy brushstroke, making the contours soft and lightly washed out. His approach to the subject was generally livelier than what was otherwise seen amongst his contemporaries in Leiden’s artistic circles.